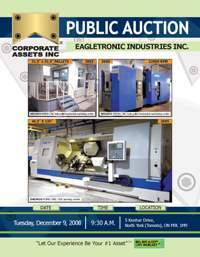 Corporate Assets Inc. | Eagletronic Industries Inc. - Corporate Assets Inc. FEATURING: Over 40 large capacity CNC vertical, CNC horizontal, and CNC turning centers as new as 2005! KIA, NIIGATA, ENSHU, DAEWOO, MITSUI SEIKI, DAINICHI, etc! Complete high precision grinding department featuring JOTES, TOS, and KELLENBERGER etc. Large tool room, and over 1000 lots of precision inspection equipment. Visit web for complete listing and brochure!